At 130 kilometres squared, Assassin’s Creed Odyssey is the biggest world that Ubisoft has created yet for the epic historical series. It’s also the most visually arresting; after the endless deserts of last year’s Origins, it’s refreshing to explore a series of Greek islands that are lush with vegetation and dense with fascinating architecture. But how does the PC port fare? With such ambition and scope, there are plenty of potential pitfalls. We all know too well the tale of the open world plagued by bugs and inconsistencies, which is why we’ve put Assassin’s Creed Odyssey to the test in our PC performance review. Our performance reviews are written to offer you the broadest picture possible, focusing on hardware similar to what the majority of players have installed in their machines, based on the findings of the Steam Hardware Survey. We test the game on all graphical settings using an i5 powered rig with 8GB of RAM, and try to hit 60fps with four popular graphics cards. Even if your PC is not identical to our test setups, you should still be able to estimate the performance levels you can expect from your own machine with our results. For this performance review we're using our reliable test bench: a PC designed and built to match the kind of machines that most people play on at home. Forget that Titan X and 4K display, this is a rig that’s actually affordable. 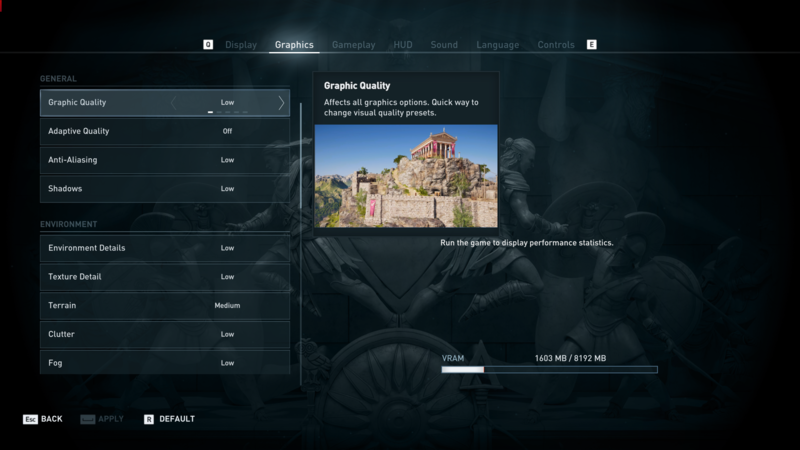 Assassin’s Creed Odyssey has 16 settings split across four categories: general, environment, characters, and postprocessing. These categories each contain the typical options, such as shadows, fog, texture detail, screen space reflections, volumetric clouds, and ambient occlusion. There’s nothing above and beyond to surprise you here, but nor is the selection lacking. There’s also an adaptive quality setting that can be toggled on and off. This is a feature that is often used in console games, and dynamically adjusts graphics settings to help maintain smooth performance. When the going gets tough, Odyssey will make itself look less pretty to keep the frame rate up. Typically we’d advise keeping away from these kind of options, but as you’ll discover later in this review, you may find it’s something to consider. For our graphics analysis we compare similar screenshots taken on the four standard presets of ultra, high, mid, and low. Assassin’s Creed Odyssey does have a ‘very high’ preset, too, so there is an additional layer of granularity between the settings sampled in these screenshots. Odyssey is a wonderfully pretty game with all its settings cranked up to ultra. Artistically, it’s similar to Origins; a halfway house between photorealism and stylish idealism. Most striking in the image above are the shadows, their high resolution meaning every element of the casting object is captured realistically, with solid silhouettes from the nearby canopy, and blurrier ones from the moving tree branches. As with most modern games, much of the visual achievements can be put down to the lighting, which emphasises the sharp texture and model work. 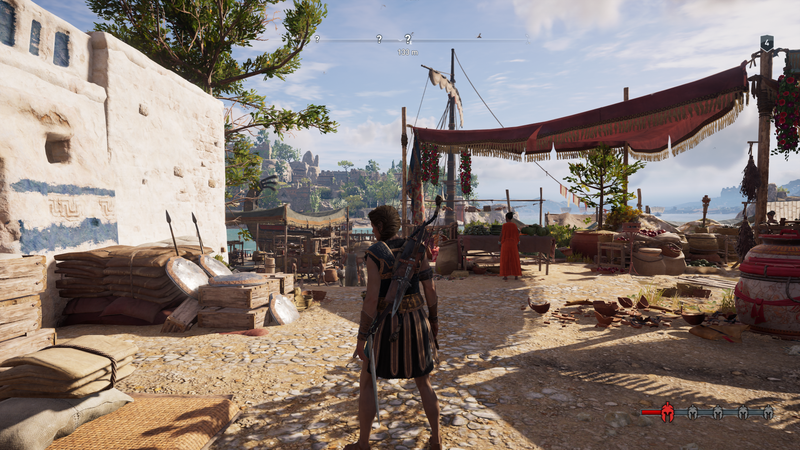 While Assassin’s Creed Odyssey is pleasing to the eye, it’s less forgiving on your hardware. Our test rig manages to push out an average of 39fps at ultra, with a low of 14fps. That’s not a stellar score, although there are things to be taken into consideration. Odyssey’s world is dense with detailed scenery and characters, and the landscape is often open enough to reveal huge vistas with impressive draw distances. This all places far more stress on your system than a linear game with smaller environments, and so a lower fps should be expected. Last year’s Assassin’s Creed Origins managed to hit an average of 53fps on the same machine, though, which is substantially better. Both games have near identical system requirements, too. It’s disappointing that Odyssey can’t hit those highs, but on the plus side, this is Assassin’s Creed looking its best at better-than-console frame rates. The high preset maintains much of the visual splendour of ultra, with two notable exceptions: the leaf density of the trees is significantly reduced, and the quality of the shadows has been reduced, removing some of the finer detail from the silhouettes. Aside from that, though, it’s difficult to spot any difference between the two presets. In regards to frame rate, high hits an average of 54fps on our test PC, making it much smoother than on ultra. We’d have hoped for over 60fps, but by being within touching distance of the god standard, high offers the best compromise between graphics and performance. Between ultra and high is a very high preset, which looks near indistinguishable from ultra, but averages at 49fps. Depending on your PC, you may want to experiment with both the very high and high presets if your preference lands on graphics rather than performance. A washed-out look afflicts the medium preset, which is due to a reduction in lighting and texture quality. Reduced ambient occlusion prevent the stony effects on the floor and walls from looking as dramatically 3D as they do at higher presets. The reduced texture resolution means the smaller details bleed into each other, too, and the shadow quality is decreased once again, with much blurrier edges. With an average frame rate of 68fps, though, this is the option to take for those looking to balance graphics with stronger performance. At its lowest settings, Odyssey is noticeably split into two. Its models remain impressive, and the world maintains a long and detailed draw distance. But there’s a significant reduction in texture quality, with every item and surface in the world patterned with blurry skins. While texture quality is reduced from setting to setting, this is the most drastic change. The low preset averages at 76fps, and so doesn’t offer a huge advantage over the medium preset. However, if you’re finding your PC is struggling – which you certainly will if your machine uses a card a generation older than our GTX 1060 – this may be your only option for a smooth experience. To see how Assassin’s Creed Odyssey performs on various hardware setups, we test the game on four graphics cards – two from Nvidia, and two from AMD. We’ve sampled popular cards from the current and previous generation of GPUs based on the findings of the Steam Hardware Survey in order to offer the most useful information. All four cards are tested at the highest settings, with every texture option set as high as they’ll go, and every graphical effect turned on. For this test we have used the in-game benchmarking tool, which renders a fly-through of one of the game’s areas to generate an average frame rate count. Assassin’s Creed Odyssey is brutally punishing on your rig, and both current and previous generation cards suffer. Simply put, ultra settings aren’t for mid-range setups. This could just be a sign of the times – what we consider mid-range has to become low-end eventually. However, it’s worth remembering that last year’s Assassin’s Creed Origins was fitted with two forms of DRM that had a heavy impact on performance. It may be that the same is true of Odyssey, which would explain its low figures. From personal experience, I can attest that things are better on a GTX 1070, with an average of 41fps at 1440p – it produces similar stats to what the GTX 1060 can do at the much lower 1080p resolution. For anyone running cards akin to our R9 380 and GTX 970, the only way to squeeze 60fps out of Odyssey is to opt for the low preset. This means you’ll be seeing Odyssey’s world at its ugliest, but you’ll be able to get the best out of its combat at the higher frame rate. When it comes to more modern cards, those with the GTX 1060 can comfortably opt for the medium preset. Alas, the RX 580 struggles to hit 60fps even at medium, and so you’ll need to opt for low with cards of a similar power offering. While it won’t help you hit 60fps, if you’re playing on a machine that’s truly struggling, it may be worth considering turning on the adaptive quality option to help strike a balance between looks and whatever performance can be garnered. 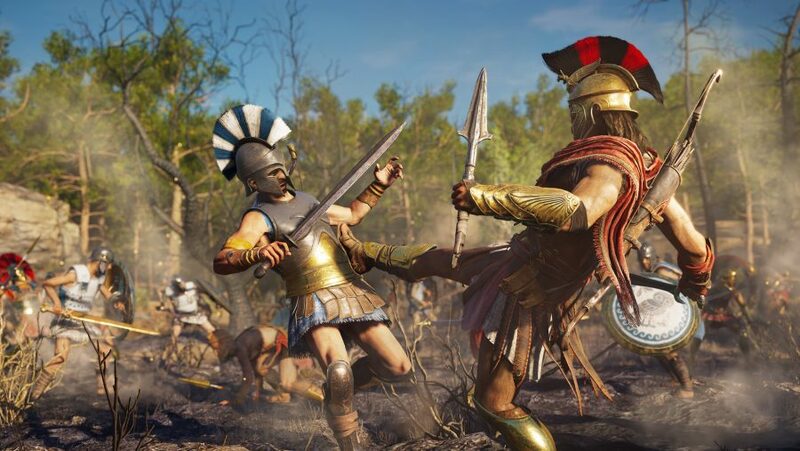 Assassin’s Creed Odyssey is not particularly friendly to the average PC, and there are a few possible reasons for this. Firstly, there’s the chance that Odyssey simply isn’t well optimised. Origins is similar in scope, design, and system requirements to Odyssey, and it simply ran better. If this is not the case, then it could be that Odyssey’s massive, detailed world simply requires more juice than the desolate dunes of Origins’s Egypt, and thus leaves lower-end cards in the dust. Alternatively, it could be that Ubisoft is experimenting with another aggressive DRM system that demands a huge chunk of processing power on top of the game. Origins employs two forms of digital rights management, including Denuvo, and the two put a lot of pressure on PC systems. If similar systems are being used for Odyssey, it could explain the failure to meet 60fps on anything other than the lower-end settings. But, while performance is poorer than we’d like, it must be said that Assassin’s Creed Odyssey is a well put together port. The options menu is robust, and offers the now-standard Ubisoft tooltips for each setting, which is especially helpful for PC players inexperienced in graphics tech. The benchmarking tool provides detailed readouts, and anyone looking to tweak and nudge the game into the best performance possible will find it helpful. The game is also notably stable for an Assassin’s Creed game: don’t expect people’s faces to inexplicably fall off and leave their eyeballs floating in mid-air. With the options and tools available, and the general excess of power that the PC has over consoles, you’ll get prettier 1080p at standard console performance with the PC version. But after a series of ports from Ubisoft that have marked a high point for triple-A console ports, we’d hoped for much better from the developer’s flagship game of 2018. An incredibly beautiful open world and solid collection of options is held back by less than desirable frame rates. Assassin’s Creed Odyssey is best reserved for those with only the punchiest PCs.